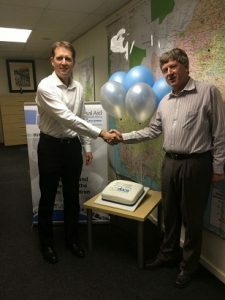 To celebrate Legal Aid South Africa deploying our document automation software across the whole of South Africa, Roger Buissinné (left) from HotDocs partner Intuate Group was dispatched to the organisation’s Johannesburg office to present cake and balloons to Patrick Hundermark (right), Chief Legal Executive at Legal Aid South Africa. Legal Aid SA is a non-profit public entity that offers assistance to citizens who do not have the resources required for legal representation. The organisation uses HotDocs to produce legal documentation for clients across 135 locations in South Africa and through an online self-help web service. Our leading document automation technology helps Legal Aid SA to produce client paperwork more quickly and accurately across a range of legal areas including divorce, guardianship and eviction, increasing efficiency and improving both service delivery and access to justice for clients.